Introduction: Between 20 to 40% of type 2 diabetes mellitus patients (T2DM) develops nephropathy. It is considered the most common cause of end-stage renal disease. 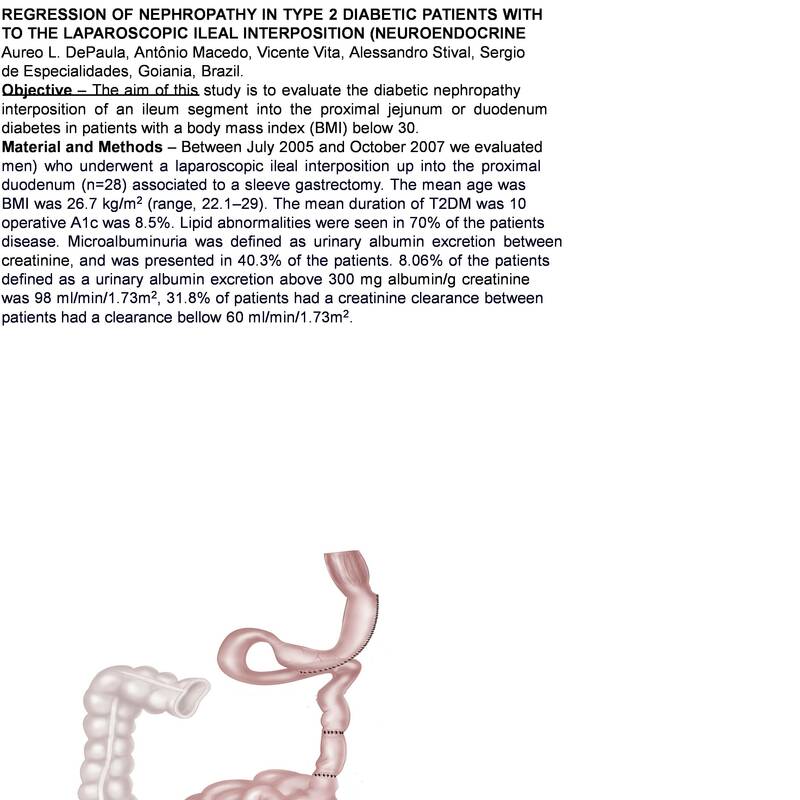 The objective of this study is to evaluate the regression of nephropathy in patients with T2DM with BMI below 30 that were submitted to the laparoscopic ileal interposition associated to a sleeve gastrectomy (LII-SG). Methods: The procedure was performed in 72 patients. 51 were men and 21 women. Mean age was 52.8 years (38-66). Mean BMI was 26.7 kg/m2 (22.1 – 29.4). All patients had evidence of stable treatment with oral hypoglycemic agents and or insulin for at least 12 months. Insulin therapy was been used by 51.4 of the patients. Mean duration of T2DM was 10.5 years (3-22). Mean A1c was 8.5%. Microalbuminuria (30-299µg/min) was diagnosed in 40.3% of the patients and macroalbuminuria (>300 µg/min) in 8.4%. The mean clearance of creatinine was 98.2 mL/min (45-111). 4.5% of the patients had creatinine clearance below 60 mL/min. Forty patients (55.5%) had arterial hypertension. Results: Mean post-operative follow-up was 24.5 months (12-38). Mean postoperative BMI was 21.2.kg/m2 (17 – 26.7). Mean A1c was 6.1%, ranging 4.4 to 8.3. Overall, 91.4% of the patients achieved an adequate glycemic control (A1c < 7) without anti-diabetic medication. A1c below 6 was achieved by 50%, 41.4% had A1c between 6 and 7 and 8.6% had A1c above 7. Microalbuminuria was normalized in 86.2% of the patients. Macroalbuminuria was no longer characterized. The mean clearance of creatinine was 116mL/min, ranging from 58.6 to 145. Arterial hypertension was controlled in 90% of the patients.